...let me count the ways: late lit nights, strappy dresses and flip-flops, crickets and fireflies, outdoor events, water parks and, best of all, no school-stuff to attend. Of course, right now I'm not so thrilled we're already being hit by full on summer heat because my a.c. is broken, has been for over a week, and (due to a very long and terribly dull story that I will not torture you all with) can't be fixed for at least another week. So maybe my list should be ah, summer, how I would adore thee if only I could get to sleep at night without feeling like an icky sticky sweaty mess. Still, sweaty nights and all, I'm still happy summer has begun--and I hope to be posting about some of my favorite summery items from etsy soon. 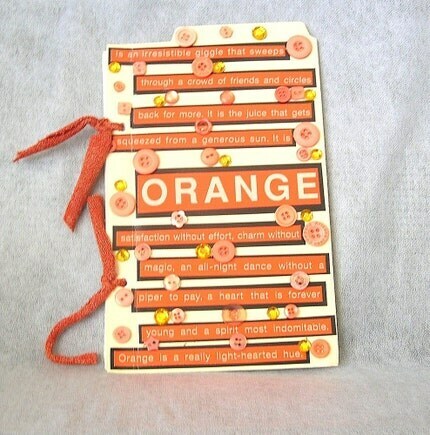 Isn't this orange journal fun? 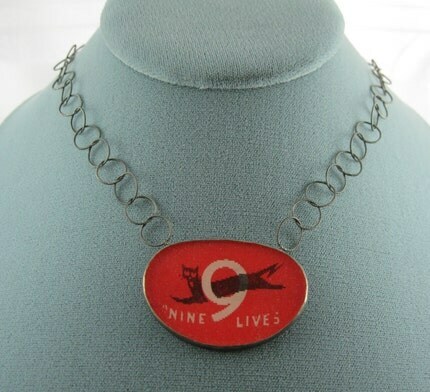 It was one of the items that really caught my eye in CreateAThought's shop on etsy (she's this month's featured etsyblogger, and she has all kinds of nifty pins, journals, and other fun goodies--plus a blog). 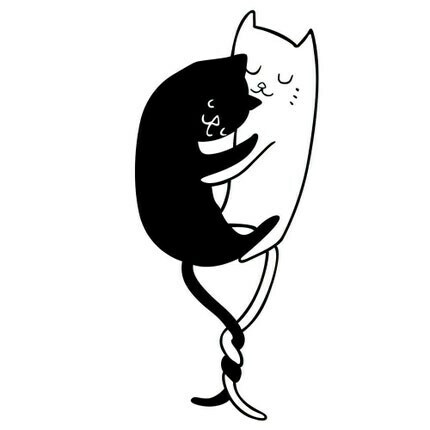 Time for more kitty cuteness from etsy - this first one is vinyl wall art of two kitties who are obviously in love, from Subhuti. Sweet, right? I love the intertwining tails especially. 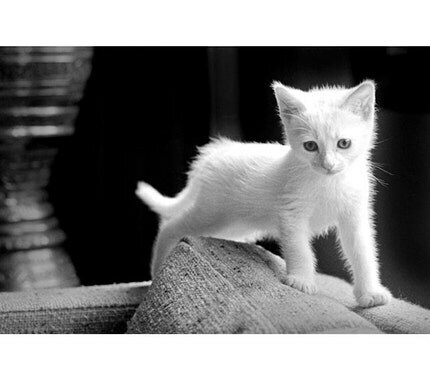 It's available in a bunch of different colors too, though I'm always a fan of the black and white. these especially intrigued me because they're not just sweet they're also functional -- you can heat them up or freeze them for headaches, muscle aches, etc. What a great idea, right? She also has tons of other cute kitty stuff; this shop is definitely a new fave. 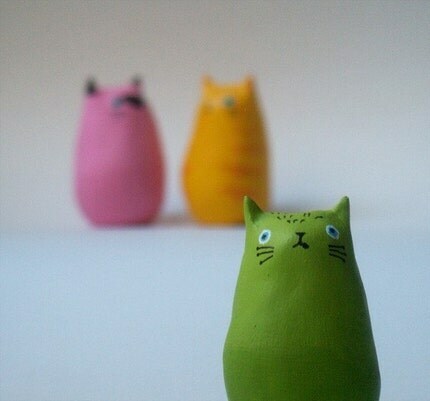 Then there's these adorable little painted plaster kittiesfrom YacsPocket. Another person apparently determined to tempt my love of fat cats. These are called "tascanimalis," a term the artist coined that is "made up of two italian words 'tasca' (pocket) + 'animali' (animals)" (The artist is based out of Italy). Such cuteness! That (issokeety) is my phonetic approximation of the cry that escapes me every time I see a cute kitty somewhere. It wouldn't matter if I was in the middle of teaching a class on the ever-boring comma-splice--if, somehow, a cat were to walk past the classroom all brain functions would cease, that cry would pop out, and I'd be forced to try to convince the cat to come over and be petted. (I never go to them--I know it would accomplish nothing). 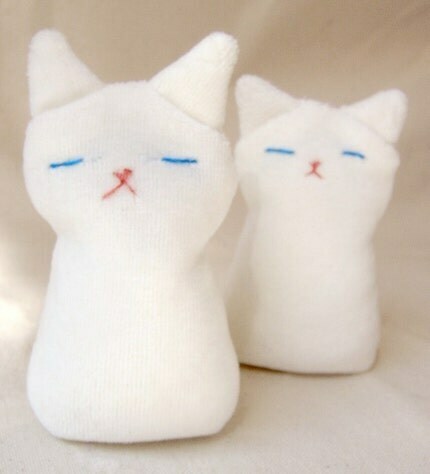 Today, then, I decided to do a search for "cat" on etsy to see if any irresistible kitty cuteness came up. There was plenty to love, so I'm breaking my post into parts so as not to overload your brains with tooo much felinity. 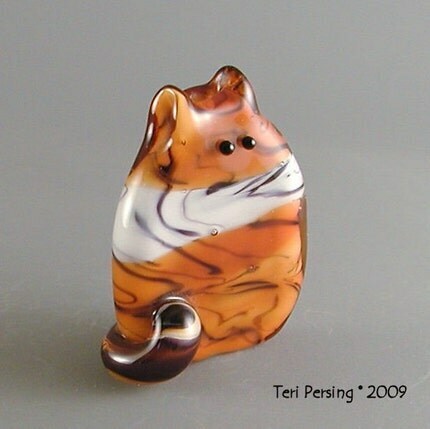 First, there's this adorable fat cat glass bead. I figure this is the perfect way to adore my love of fat cats without ever having to actually allow one of my own cats to lurk in that unhealthy state. Teri Persing has a bunch of different fat cat beads too, in all different colors, but I just couldn't resist this adorable creamsicle-colored one. And now for the one that inspired my afternoon etsy jaunt: Farley from justamoment (who, incidentally and unsurprisingly, has a lot of kick @$$ photos). Isn't this a freakin' awesome photo? C'mon, you know you want to say it with me..."Issokeety!!!" 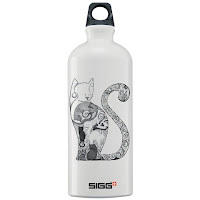 I was both excited and disappointed when I found out today that CafePress is now making it possible to put your own designs on Sigg water bottles--excited because I love these things, disappointed because I literally just bought a plain one for my husband yesterday--and to think he could have been sporting a PurrPrints design! Now I'm just trying to come up with an excuse as to why we'd need another one of these indestructible bottles when we already have 2 - suggestions, anyone? Oh--and if you want one, right now I have them in 4 of my designs (Floppy Cat, Kitty Love, Hypnocat, and Sabrina and Friends), but I can put them up in any design you like (just let me know). I'd also welcome suggestions as to what PurrPrints design should go up next in its very own CafePress shop (I know, I'd rather do it all handmade, but my dissertation will be putting some extreme limitations on what I can make over the next year, so Cafepress is my best bet for keeping PurrPrints still running in some shape or form).